If you'd rather learn how to build your website yourself, I can help you there as well. I offer training in basic website design using Dreamweaver or Wordpress. I can also provide basic or advanced Photoshop and photography training. 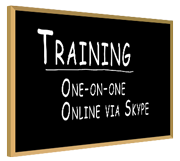 I can also suggest some very good online training that is available either for free, or at a very reasonable cost. Creative Live is located in Seattle and provides both free and paid training. Their business model is to stream the class live as it's recorded and then sell access to the training once the class is complete. They cover a variety of web design and photography topics. Layers Magazine covers nearly all Adobe products. They've stopped publishing the magazine but the website still offers free content. Lynda.com is a paid subscription training provider. They offer a wide variety of very in depth courses including basic and advanced Dreamweaver and Photoshop as well a numerous other programs and programming languages. National Association of Photoshop Professionals (NAPP) is a paid annual membership that includes a magazine as well as online tutorials. You can easily recover the $100 cost of annual membership through member discounts. They primarily focus on photography and Photoshop training. Kelby Training is a spin-off of NAPP and offers complete online classes. Most are related to Photography and Photoshop but they do have some basic classes covering Dreamweaver and Wordpress.